This story, published in October 2014, takes on an entirely different tone in light of accusations of sexual assault against Fred Lee published in Alive Magazine on February 5, 2019. If the accusations prove true, or even partially true, they are disturbing, reprehensible and I condemn them in the strongest possible terms. I contemplated deleting this story, but I view this blog is an archive of how the world of craft beer has evolved in Central Ohio over the past 5+ years. For better or worse this is how I saw things 4.5 years ago. While Fred looms large in any story about Actual Brewing many other people who are not complicit in his actions have worked there and made valuable contributions to the craft beer scene in Columbus. It is my belief that their contributions shouldn’t be completely erased from the collective memory. It’s a gorgeous mid-September evening, the kind that makes you wish autumn was the longest season of the year. We are on our way out to Actual Brewing where I have an appointment to meet Fred Lee, head honcho, or to use his official title, Elder Beerman, at Actual. Based solely on the interviews I’ve read, Fred seems like one of the more colorful characters on the Central Ohio beer scene. In case you haven’t been spending your free time browsing the web for stories on Ohio breweries I’ll briefly summarize what I knew about Fred prior to our meeting (read stories by Rick Armon, Drink Up Columbus, and Columbus Underground for more details). Fred joined the Navy after high school and worked as an information warfare specialist, lived in Japan for several years, and was vice president for information and risk management at PNC Bank before starting Actual. While I’ve no doubt that having a background in risk management is useful trait for managing a brewery, the terms “colorful” and “bank vice president” are not usually uttered in the same sentence. The fact that he bears a passing resemblance to Zach Galifianakis and his e-mail name is F. Dangerous Lee, piques my interest. 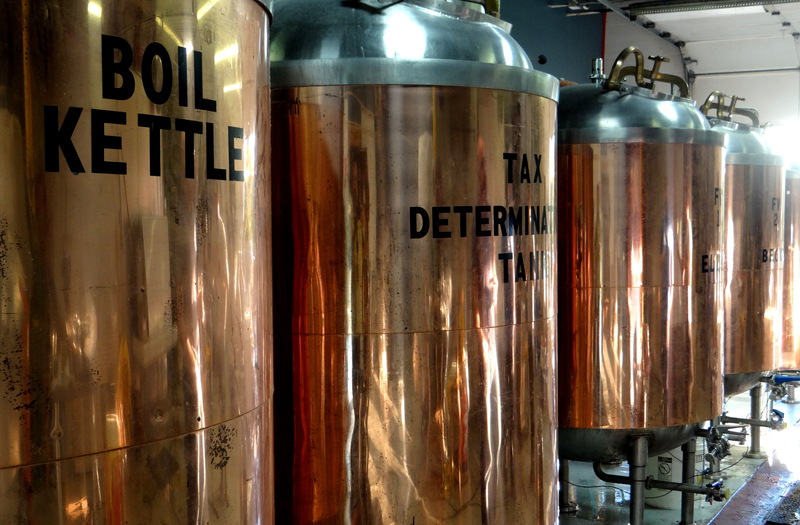 The fact that Actual runs a chemical laboratory for culturing yeast and analyzing beer further heightens my interest, but the coup d’etat is the story of how Actual Brewing got its name. Fred and his partners considered starting a religion called Actualism that was based on two themes—science and beer. Because serving beer to your community was a moral obligation in the church of Actualism, they could in principle sell beer tax free. They went so far as to file paperwork with the IRS, but the idea was eventually abandoned. While that was probably a wise move on Fred’s part, I’m more than a little disappointed that I didn’t have the opportunity to attend at least a few congregational meetings. I can picture myself sipping on a Fat Julian, while listening to a discourse on why Linus Pauling’s scientific impact equals that of Albert Einstein, but his place as a cultural icon was diminished by a propensity for wearing berets. Needless to say I’m looking forward meeting Fred. Actual Brewing is located in an out of the way spot a little southwest of the Columbus airport. The taproom is open 5-10 pm on Wednesdays, Thursdays and Fridays. The first time you head out to Actual I would advise using a GPS system to help you find your way. If it seems like it is directing you to a nondescript set of industrial buildings that appears to be a dead end, you are on the right track. Despite its unassuming locale the place is hopping when we arrive. A food truck housed in a shiny silver Airstream trailer is parked in front of the brewery (Land Yacht BBQ, more on that later) and twenty or so people are either in line ordering food or eating food and drinking beer at one of the folding tables that have been set up in the parking lot. The doors to the brewery taproom are open so that everyone can enjoy the idyllic fall weather. Fred is pretty recognizable so I spot him right away, but since he is ordering food we decide to step inside to have a beer. The inside part of the taproom is relatively small and divided into two parts by a half wall. On one side there is a small bar with seats for 4-5 people, while the other side vaguely resembles a college apartment. There are a couple of tables, a TV hooked up to a Nintendo system, an arcade game where contestants try to (virtually) knock down bowling pins with cans of Coors Light, and a shelf full of books that probably don’t get read very often (mostly about science and brewing, aptly enough). The taproom is full of people standing, drinking and talking, three women are playing Mario Kart, no one is reading the books. I inspect the menu to see what is on tap tonight. Every time I’ve been to the taproom there are five beers on tap, and this visit is no exception. Though I should stick with something lighter I can’t resist the temptation to order a glass of Fat Julian, an imperial stout that in my opinion is on its way to becoming one of Columbus’ iconic beers. It’s grail-like quest to track down a bottle of it in the stores, but I almost never pass it by when I find it on draft. At the taproom they pour it on a nitro tap which makes it oh so smooth and creamy. It has all of the complexity you look for in an imperial stout (dark chocolate, hints of leather, a kiss of dark fruit) but it manages to finish dry and the 10% abv is exceptionally well hidden. My friend Mark opts for a beer from the other side of the spectrum and orders a pint of Photon Pilsner. You can learn a lot about a brewery from its lightest beer because there is nowhere to hide mistakes. What you learn in this case is all good. Photon is crisp and easy drinking with more flavor than you have a right to expect from a 3.4% abv beer. Actual makes a number of flavorful and interesting beers that fall somewhere between the extremes of Fat Julian and Photon. Conductor Imperial Rye is one of the best Rye IPAs you’ll find anywhere. Elektron is a nicely balanced amber ale made with rye in the malt bill and hopped with Ohio grown hops (at least at this time of the year, see story in the Columbus Dispatch). Their Ingenuity Lemongrass Saison is a refreshing, citrusy summertime sipper that held its own in my saison blind taste test. 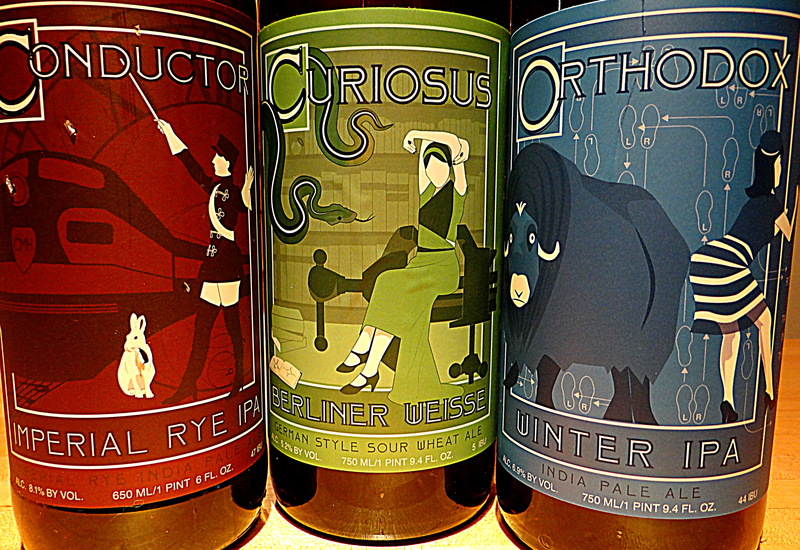 If you are interested in more information check out my earlier reviews of Orthodox Winter IPA, Curiousus Berliner Weiss and Conductor. 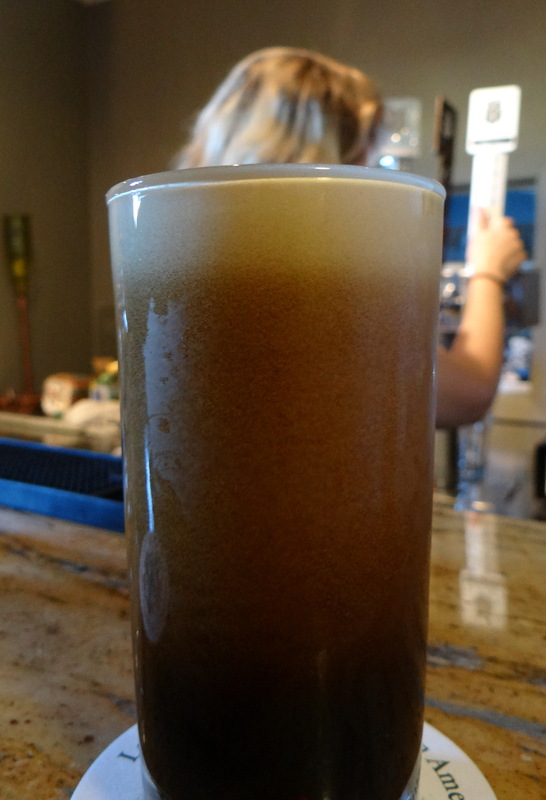 The nitro cascade on display in glass of Fat Julian. After a few minutes I introduce myself to Fred and let him know that I’ve arrived. He’s just picked up a basket of brisket from the food truck and I urge him to eat his food before we get started. He doesn’t listen though and insists on showing me around before eating his dinner. After a brief stop to see the room where the coffee roastery is located, we head straight for the chemistry/biochemistry lab. For a small operation like Actual to have a chemical analysis lab is unusual, and it is clear that Fred is enthusiastic about this part of the operation. The have instruments such as a UV-Vis spectrophotometer for taking IBU and SRM measurements, a gas chromatograph (GC) for measuring the volatile components in the beer, a pH meter, a digital balance, and a distillation column. Fred gets most excited when he shows me what they are doing with yeast. In addition to troubleshooting yeast problems of other breweries, and doing all that they can to keep their own yeast happy and healthy, they are working on developing local strains of wild yeast. When I ask him how this figures into the brewing program at Actual, Fred tells me there are plans to expand into the next building and start a program of barrel aged sours and American wild ales. I find this to be a very exciting development and I’m looking forward to the day that plan becomes a reality. Next we move into the back of the building where the brewery is located. They have a 10 barrel copper system that is considerably larger than the kits at Zaftig or Sideswipe, but about half the size of the new brewing systems at Zauber and North High. There is an interesting back story on how this equipment ended up at Actual. In the days before Actual was a reality, Fred was talking to a welder who was doing some work on his pilot brew system. When he told the man he was looking for equipment, the welder suggested Fred get in touch with his neighbor who just happened to have a used brewing system sitting idle in his barn. Although it seemed an unlikely story Fred checked it out and found it was true. The brewkit that was gathering dust in a barn used to make beer at the New Albany Country Club. Apparently the welder’s neighbor bought it on the cheap at an auction. Through this serendipitous encounter Actual was able to get started with a decently sized brewkit at a bargain basement price. Next we run into Zach Harper, whose title is Cellarman, meaning that among other things that he heads up the barrel aging program at Actual. Zach lets us sample a batch of bourbon barrel aged Conductor. The barrels are third use (they had previously been used by Elevator Brewing for their barleywine Bar-Bar) which keeps the bourbon from becoming too dominant, but the barrel aging definitely enhances and intensifies the positive attributes of what is already a great beer. Zach tells us that a release of barrel aged Conductor and Elektron is in the planning stages and should happen sometime this fall. We talk a little bit about the challenges of adding a line of sours without accidentally turning Actual into a sour only brewery, as happened at Jolly Pumpkin. There is a band (or at least a drummer and a guitar player) who are practicing a set of classic rock songs in the back of the brewery, which makes it a little hard to talk but adds to the party like atmosphere that has descended on Actual for the evening. After a few more minutes of banter I let Fred go so he can return to his now cold brisket. Meanwhile I realize that I am starting to get pretty hungry, so I decide to see what the food truck has to offer. As mentioned earlier Land Yacht is housed in a repurposed Airstream Trailer with a sign on the top modeled after the Welcome to Las Vegas sign. While I’m tempted by the lamb bacon mac & cheese, I end up ordering a slow smoked beef brisket sandwich and a side of fries. That might have been the best decision I made all week. The beef is so tender it falls apart in your mouth and the bbq sauce has just the right mix of savory and spicy. 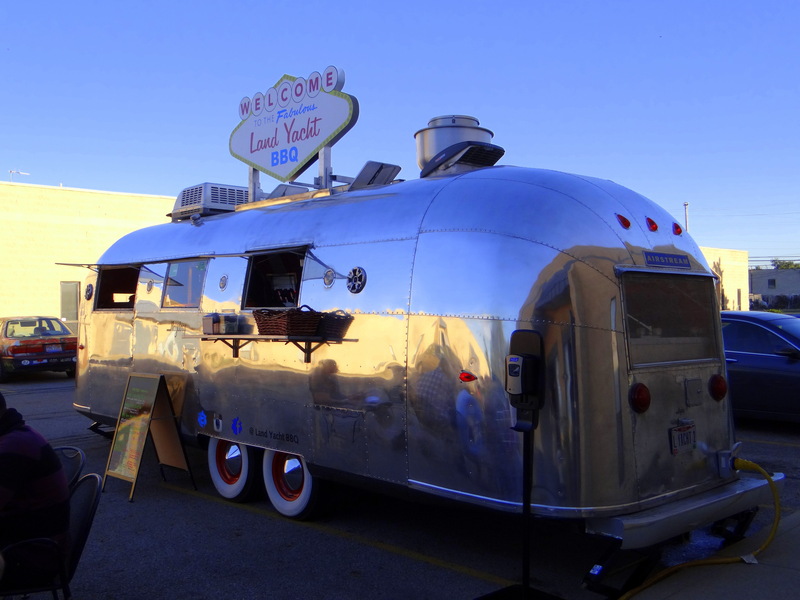 If you ever come across the Land Yacht BBQ truck I highly recommend it. When not out and about at special locations like this one, they are located near Haydocy Buick GMC, which itself is near Hollywood Casino on the west side. In an increasingly crowded Columbus beer scene, Actual Brewing is doing a number of things to differentiate themselves from the crowd. They make flavorful beers in styles that are not widely replicated in Central Ohio. The art that goes into those beers doesn’t stop on the inside of the bottle either their labels are works of art in and of themselves. If that wasn’t enough the chemical analysis laboratory and their yeast program set them apart from other area breweries. I’m very excited to see what develops as they put out more barrel aged beers and develop a sour program. As for Fred Lee he definitely lived up to my expectations. In person he is colorful, friendly, and passionate about beer. So the next time you have to pick someone up at the airport, to hell with the cellphone waiting lot. Head out a little early and enjoy a glass of beer at the Actual taproom, with a little luck your companions flight will be delayed. If your friends and family have a fear of flying make whatever excuse you need to visit the Actual taproom. 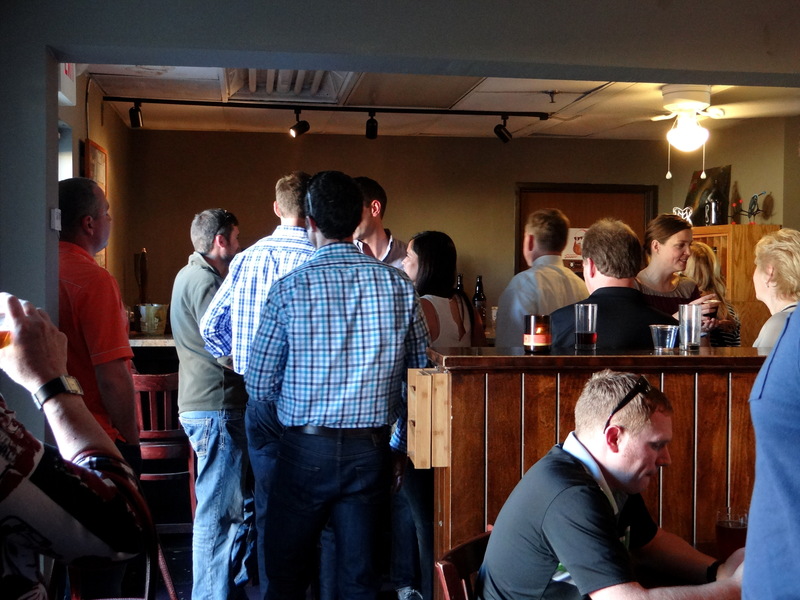 The vibe is laid back and fun, the beer is tasty, and the staff are über friendly. They have a long way to go, seen their act at a craft brew fest or two, not impressed. Fred was apologetic for adding oranges to their creation, but maybe will try again. I would argue that all newer breweries who are trying to do creative things are going to have some missteps (and not just newer breweries). When they have got it right (Conductor Imperial Rye, Fat Julian) I think the result has been impressive.